Who were the Puritans? The word Puritan has different meanings to different people. To some it means a clean and unspoiled view of God and government. To others it smacks of intolerance and hypocrisy. In the North American colonies, it had one interpretation in Plymouth, where it was liberally applied to the community, and another in New Haven, where it meant the strictest, most unbending discipline imaginable. The Puritan soldier was among the best battlefield fighters in Europe. To some he had the rough virtues of a hardy soldier. To others, he was the burner of cathedrals who built for himself bleak, bare and white-washed meeting houses. According to one description, 'He would have no pealing anthems, organs, choirs, colored glass windows, nor Christmas festivals. His lurking distrust of enjoyment had hardened his nature into the stuff of which soldiers are made. He stood ready with texts of scripture to justify every act, whether it was the burning of witches or Quakers, the massacre of Narragansett Indians with their squaws and children, or the branding and mutilating of those convicted of lesser crimes.' According to some, no Puritan was ever a coward and laziness was considered one of the most deadly sins. One 19th-century romantic claimed that, 'The Newark founders were the highest type of pioneers, the forerunners of that mighty race of picked men that have given the great west the leadership of America.' While this view of the 17th-century Newarker was obviously exaggerated, there was some truth to the claim that Newark's forebears were sturdy, determined, brave and well-equipped to handle almost anything in a wilderness society. Newark was the last Puritan settlement in America. After years of dispute in England, the eventual overthrow of King Charles I, the reign of Oliver Cromwell during exile in Holland, and the first coming to Massachusetts, then Long Island, and on to Connecticut, the Puritans' last attempt to establish a 'theocracy in Zion' was realized right here in Newark in 1666. Today, we look at the distinguished and venerable Old First Church building at Broad near Branford, mother church of New Jersey Presbyterians, as the reason why Newark came into being. However, when those first settlers arrived, they were actually Congregationalists who later became Presbyterians. Old First was essentially organized in Branford, Ct., in 1644. It was 'transferred to Newark in 1667, and was settled in the Congregational order of the most primitive and distinguished style.' From 1667 until 1719, it was Congregational. Based on this fact is the claim that Old First is indeed the oldest Christian assembly in Newark: 'They came to the Passaic town in order to established a little commonwealth with laws based on the Scriptures, and in which no one should enjoy full citizenship, unless a member of the Congregational Church.' This also included the right to hold office and vote. In 1629, King Charles I dissolved Parliament, prompting many Puritans to flee to America, where they settled in several Atlantic communities, not as centers of religious freedom but as places to practice their own narrow beliefs. As noted, there were different Puritan settlements along the seaboard from Massachusetts south to Newark. Our immediate predecessor was the New Haven Colony approximately 100 miles northeast of here, which also included the villages of Branford, Guilford and Milford. In these places, there was no difference between church and state. While the Puritans had just fled intolerance, 'no sooner did they have freedom to follow their own devices, untrammeled for a time by home government, that they drew up the most drastic laws and enforced them with firm harshness.' The New Haven founders asked nothing of English law. They used the Bible as their guide to government, agreeing that 'Wisdom hath built her house; she hath hewn out seven pillars.' This command was taken literally by a seven-man council that included the governor, four deputies and magistrates. Juries were not included, since Mosaic law did not mention them. For several years, this harsh, undemocratic form of government limped along. Then in 1662, it merged with the larger Connecticut colony, largely to protect itself from possible attachment by England. Charles II was back on the throne, pursuing the two judges who had ruled against his executed father and who supposedly were living in the New Haven jurisdiction. The events leading up to the settlement of Newark were complicated. They include activities in the Newark area as well as in New York, Connecticut and England. In 1664, the Dutch were defeated by the English. As a result, New Amsterdam passed from Holland's control under Peter Stuyvesant to Col. Richard Nicholls. King Charles II gave all this territory to his brother, James, Duke of York, who in turn passed it to Lord John Berkeley and Sir George Carteret. In 1665, Sir Philip Carteret took control at Elizabethtown, where he was visited by Capt. Robert Treat and John Gregory, who were looking to purchase land for a new settlement. They carefully considered a number of sites. On this first trip, they visited Burlington on the Delaware, but rejected the area as too remote. They then visited the great unnamed bay and river, now Newark Bay, and the Passaic River region, which held great promise and had a handful of outposts. In May 1666, Treat planned to return with the first group of settlers from Milford. Their idea was 'to carry on their spiritual concernment as well as their civil and town affairs, according to God and a Godly Government.' Apparently they christened this new community New Milford—a name that seems to have lasted only a year. In 1667, a second group of settlers from Branford arrived here under the leadership of Jasper Crane and the Rev. Abraham Pierson. Their congregation became the First Church of Newark. With the formal organization of the town, the name Newark was adopted in honor of Pierson's original hometown of Newark-on-Trent, England. Other names of these early Newark founders have been preserved as streets, localities or local businesses or industries. They include names such as Kitchell, Pecke, Lyons, Tichenor, Baldwin, Johnson, Pennington, Crane, Swaine, Ward, Plum, Camfield and Huntington. Of all the people we could mention, none was better known than Capt. Robert Treat, who was born in England, migrated to the New Haven Colony, settled in Milford and later moved to Wethersfield. He was well educated, married twice and served as a local magistrate. As far as Newark's history is concerned, Treat was the leading civil figure in our earliest colonial past. As a relatively young man, he believed in the necessity of leaving New Haven to come here to settle. Upon arriving in Newark, he became magistrate, town clerk, and supposedly helped lay out Broad Street, the widest street in all of colonial America. Later, Treat was one of Newark's first two representatives to the provincial General Assembly. If an Indian war had come, he would have been its chief military defender. In 1672, Treat returned to Connecticut, leaving two sons and daughters behind. Upon his return to the Nutmeg State, he was appointed a major in the militia and put in charge of defending settlers from Indian attack. At the Battle of Bloody Brook, the supremacy of Native Americans in Connecticut was broken forever and Treat became an immediate hero. He also defended the Provincial charter from Sir Edmund Andros, who demanded it back and is supposed to have been the chief instigator in having it hidden in the 'Charter Oak' outside New Haven. Treat was governor or deputy governor of Connecticut for 32 years. He died in 1710 at the age of 85. 'Few men have sustained a fairer charter or rendered the public more important services. He was an excellent military officer, a man of singular courage and resolution, tempered with caution and prudence. His administration of government was guided by wisdom, firmness and integrity.' Treat was esteemed and venerated by the people in general, especially at Milford where he resided. As founder of Newark and many times chief executive of Connecticut, he could lay claim to being one of America's most important 17th-century leaders. The Rev. Abraham Pierson was to spiritual Newark what Treat was to temporal Newark. He was one of America's leading divines, studying at Trinity College, and at Cambridge with John Milton. He was greatly admired by Cotton Mather of New England and was the father of the first president of Yale. Pierson's intellect, scholarship and dedication to the dissemination of Puritan doctrine earned him the respect of colonial America. Like Treat, Pierson was born in England and ordained in Newark-on-Trent. He later moved to Boston and then to Lynn, Mass. From there, he went to Southampton on Long Island and again to Wethersfield and Branford, Ct. After a 20-year pastorate at Branford, he moved to Newark, where he lived for the rest of his life. Pierson's intense missionary interest led to his work with the Native Americans. The Indian catechism he wrote was used widely by other missionaries as well. Like Robert Treat, Pierson was a man known both inside and outside Newark. He was one who shared his talents and energies over a diverse geographical region. He died in 1678 and was buried in the Newark Burial Grounds, which no longer exist. 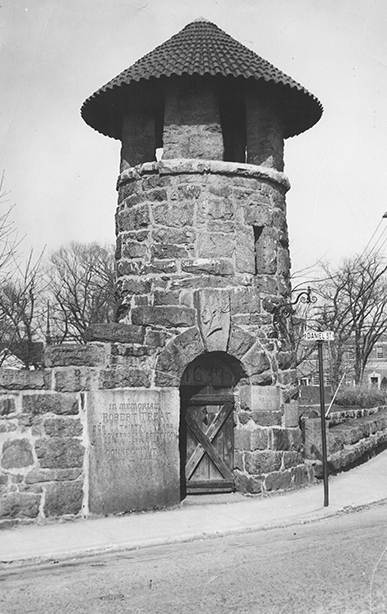 The great Puritan experiment here was largely eroded after the deaths of the first generation of these men, but many of its basic concepts—stability, common sense and stalwartness—provided the bedrock upon which an important city was built, developed and has flourished for more than three centuries.